March 2017 www.coalage.com 37 conveyor technology Innovative Conveyor Technology A leading developer of conveyor system ac- cessories recently added several products to its line. In addition to new products, Martin Engineering has also improved its training module and published a new reference for conveyor safety. The new FOUNDATIONS Plus seminar provides miners with a meth- odology for assessing risk and analyzing life cycle costs, helping them better understand the true return on investment from convey- or upgrades to increase safety, efficiency and profitability. "We've worked with customers on cap- ital projects spread across the globe in a wide range of industries for more than 70 years, and our expertise in conveyor sys- tems and material flow is truly unique," said Tim O'Harran Sr., business development manager, Martin Engineering. The company's first reference book dedicated to reducing conveyor risk and in- juries, Foundations for Conveyor Safety, by experts with vast experience in bulk mate- rial handling from around the world, writ- ten and published with the simple mission of improving conveyor safety. Designed to educate readers by identifying hazards, danger zones and unsafe work practic- es around conveyors, the volume helps raise awareness and provides guidance to management, operators and maintenance personnel. 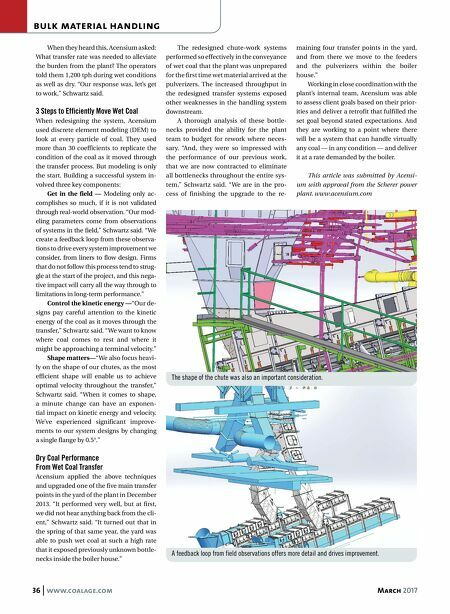 The content delivers a detailed overview of hardware solutions, global best practices, risk assessment and safer con- veyor construction, with a summary dis- cussion of the return on safety investment and how to measure the payback. One of the new products, the Mar- tin Roll Gen System, is designed to create a self-contained mini power station that allows operators to run a wide variety of electrical systems, including monitoring devices, safety mechanisms and pneumatic belt cleaner tensioners. It can also be used to power tracking devices, industrial light- ing and solenoids for air cannons or dust control in areas without convenient access to an electrical source. Suitable for retro- fitting on existing idler support structures, the device is considered a first step toward eliminating power production obstacles, as conveyors move into the next generation of "smart systems" that are predicted to be more sustainable and autonomous. Reducing Total Ownership Cost Martin Engineering said it has made a sig- nificant investment in tooling and engineer- ing and produced a patented conveyor belt cleaner that is projected to reduce the cost of ownership by cleaning better and lasting longer. A lower purchase price was also one of the primary goals in designing the Mar- tin QB1 Cleaner HD, achieved by adopting state-of-the-art roll forming equipment as part of Martin Engineering's manufacturing capabilities. The move is part of an overall plan to deliver high-performance compo- nents at industry-best prices. 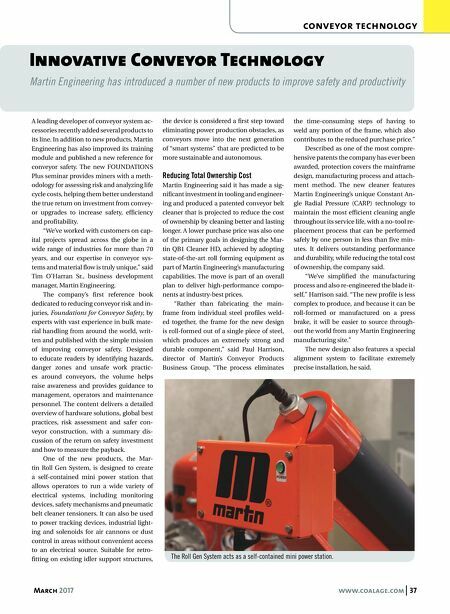 "Rather than fabricating the main- frame from individual steel profiles weld- ed together, the frame for the new design is roll-formed out of a single piece of steel, which produces an extremely strong and durable component," said Paul Harrison, director of Martin's Conveyor Products Business Group. "The process eliminates the time-consuming steps of having to weld any portion of the frame, which also contributes to the reduced purchase price." Described as one of the most compre- hensive patents the company has ever been awarded, protection covers the mainframe design, manufacturing process and attach- ment method. The new cleaner features Martin Engineering's unique Constant An- gle Radial Pressure (CARP) technology to maintain the most efficient cleaning angle throughout its service life, with a no-tool re- placement process that can be performed safely by one person in less than five min- utes. It delivers outstanding performance and durability, while reducing the total cost of ownership, the company said. "We've simplified the manufacturing process and also re-engineered the blade it- self," Harrison said. "The new profile is less complex to produce, and because it can be roll-formed or manufactured on a press brake, it will be easier to source through- out the world from any Martin Engineering manufacturing site." The new design also features a special alignment system to facilitate extremely precise installation, he said. Martin Engineering has introduced a number of new products to improve safety and productivity The Roll Gen System acts as a self-contained mini power station.